Opa-locka is a small city in the Miami metropolitan area of south Florida. When Curtiss first scouted the site, he was told that its “Indian name” was “Opa-tisha-wocka-locka.” He shortened this to “Opa Locka,” which sounded vaguely “Arabic-Persian” to him. This was the era of wildly popular “Arab” movies such as The Sheik and The Thief of Bagdad. 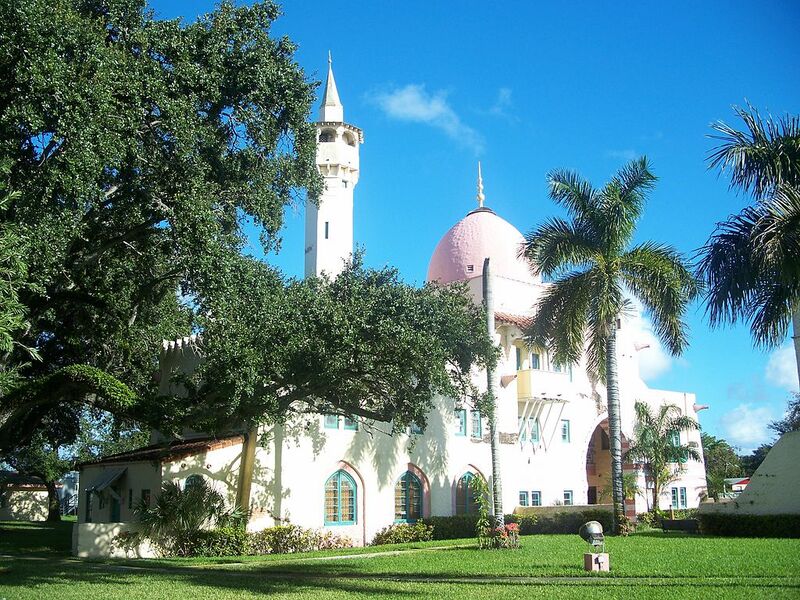 So Curtiss dressed up Opa-locka in fanciful Moorish style to match the mood of the time. Mother Earth is a woman who needs no introduction. Creek beaded pouch, early 1800s, from the Ulster Museum collection. The Creek Language Archive just gets better and better. The website recently added Creek Texts by Mary R. Haas and James H. Hill, a trove of transcribed manuscripts in the Creek language on a variety of interesting subjects. nake kērrulke ensukcv fvcfvkē omet sehok’t omvtēt omēs. it was as if their pockets were full [of knowledge]. That’s from “Belief about the ihosá” [PDF]. Creek Indians gave the name ihosá to the being that causes people to get confused and lose their way in the woods. But for those who know, the ihosá can also give power. One of the Indian phrases we white folks like to throw around now and again is the name “Long Man” or “Long Person” for a river. We tend to do this with the idea that Indians had some “primitive” idea of the river as a god of some kind. The fact is, the name and idea of a “Long Man” only occurred in some Indian cultures, in specific contexts. Comrade Kevin mentioned (here) that the name Sylacauga (a city in Alabama) is often translated as “Buzzard Roost.” That reminded me of a historical tradition in Atlanta that the city occupies the site of “Indian towns” called Buzzard Roost and Standing Peachtree. A historical marker near Atlanta spells the Muskogee (Creek Indian) name for Buzzard Roost as Sulacauga. That suggests a close tie between Atlanta’s Buzzard Roost and Alabama’s Sylacauga (pronounced “sil-la-caw-ga”). 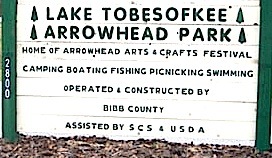 As a boy I camped out a time or two at Lake Tobesofkee Recreation Area, a nice spot beside a reservoir near Macon, Georgia. The four-syllable name [to-bə-SAF-ki] is a corrupt form of something in the Muskogee (Creek Indian) language. Recently I’ve done some reading on what the original Muskogee name might have been. In a previous post about the stereotyped Indian utterances “how” and “ugh,” I noted that “how” appears to be derived from the Muskogee Creek word hvo (pronounced “haw”). I could be wrong. Back in 1986, Cecil Adams of The Straight Dope argued for another group of American Indian languages. Someone had asked Adams whether Indians ever really used “how” as a greeting. He replied that no, they didn’t, but that in several Siouan languages of the Great Plains (Lakota, Dakota, and Omaha), there is a word that serves as “a sort of all-purpose introductory adverb or interjection.” That word is variously spelled ho, hao, hau, or howo. The resemblance to Creek hvo, another multi-purpose affirmative interjection, is striking. Even though the Creek language is only distantly related to the Siouan languages, much like English is related to Persian.